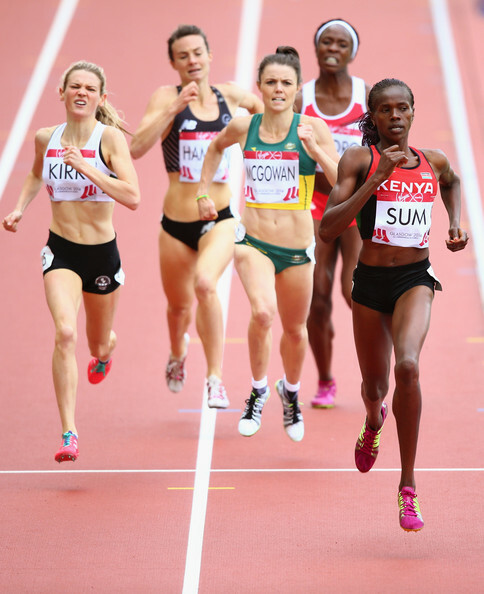 Reigning world champion Eunice Sum was simply too strong for the rest of the field in the women's 800m. 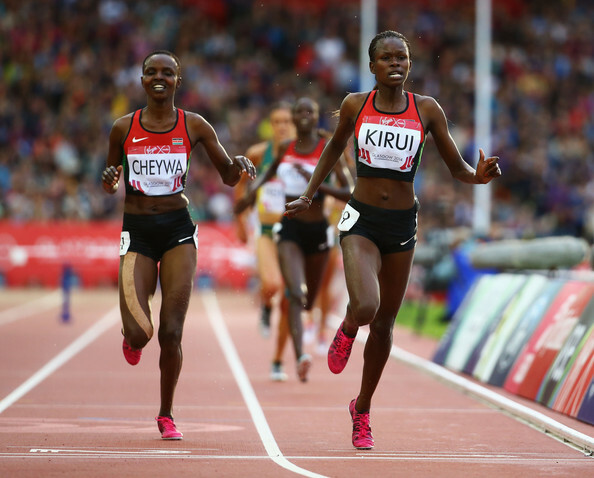 The glamourous Mercy Cherono won the women's 5000m, leading Janet Kisa in a Kenya 1-2 finish. 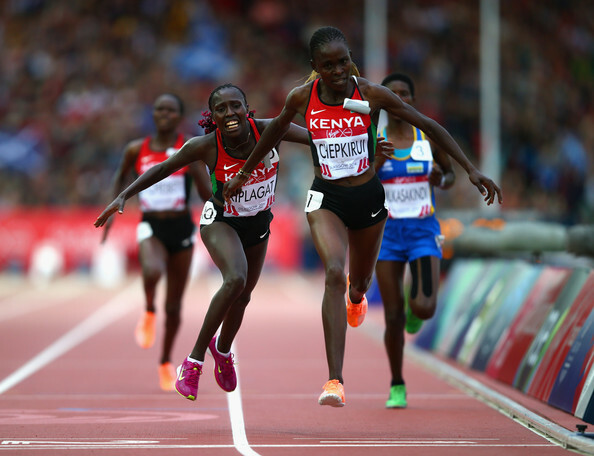 In the women's 5000m, Joyce Chepkurui staged a spectacular coup by passing the more fancied compatriot Florence Kiplagat in the last metre. 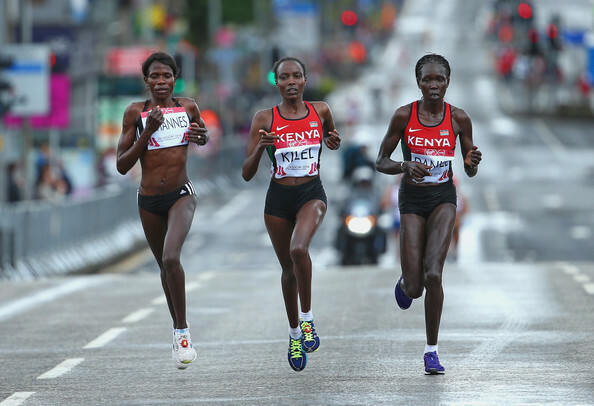 Emily Chebet won bronze. 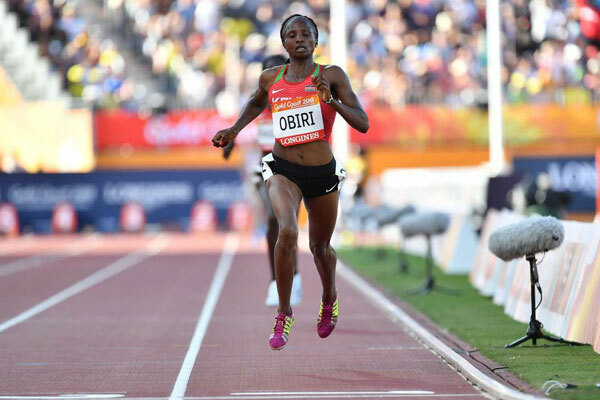 The Kenyan trio overlapped virtually every other runner in the field The young Purity Kirui took the steeplechase gold ahead of veteran and world champion Milcah Chemos. This could be the passing of the baton from one generation to the next. 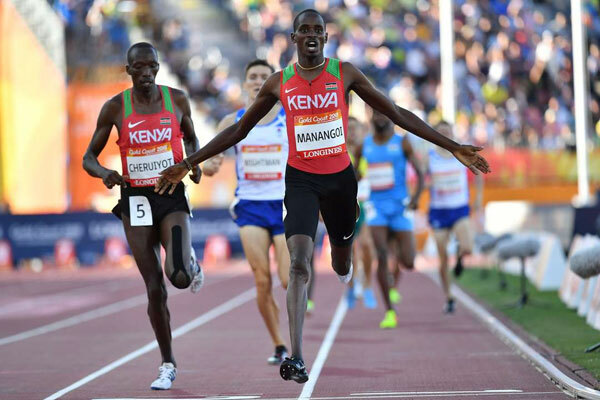 Mark Mutai won a sensational 400m race narrowly beating Sean Wroe of Australia and Ramon Miller. The result was determined only after studying the photo finish. Also notable was Grace Njue's medal in the 20km walk, an event where Kenya rarely excels. 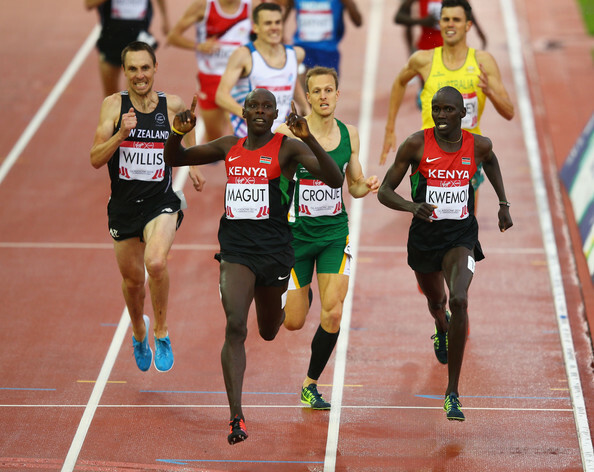 The most anticipated race was the 5000m which featured home crowd favourite Craig Mottram. It was billed by Aussie newspapers as a chance for Mottram to avenge the narrow defeat he suffered to Benjamin Limo at the 2005 world championships. Limo was injured and was not in contention as Mottram took over the lead at the last lap. However with 200m to go, Augustin Choge produced a burst of energy that left Mottram flat footed and the home crowd silent. The three boxing medals gave fans hopes that Kenya was slowly climbing back to the glory years after a disastrous campaign in 2002 when no Kenyan boxer won a medal. 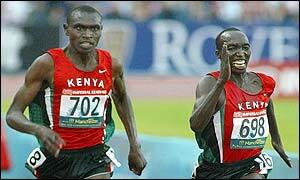 Stephen Cherono led a Kenya 1-2-3 in his last race for Kenya before he defected to Qatar and became Saif Shaheen. His brother Abraham was 3rd. All in all however, it was a dissapointing performance by Kenya. Most dissapointing were the boxing results, a sport Kenya used to dominate. Jackline Maranga held off a challenge from defending titlist Kelly Holmes of England to win the 1,500 meters in a Games record 4 minutes, 5.27 seconds. 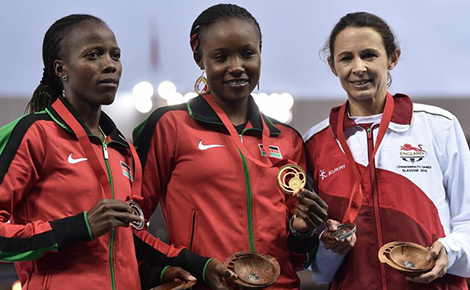 Maranga and Esther Wanjiru became the first Kenyan women ever to win gold medals at the Commonwealth games. The 1986 Commonwealth games were held in Edingburgh. Kenya boycotted along with virtually all the African countries to protest British Prime Minister Margaret Thatcher's refusal to impose economic sanctions on apartheid South Africa. Amongst the athletes who might have won medals for Kenya include Julius Korir who had won the Olympic gold in 1984. Olympic bronze medalist Mike Musyoki. 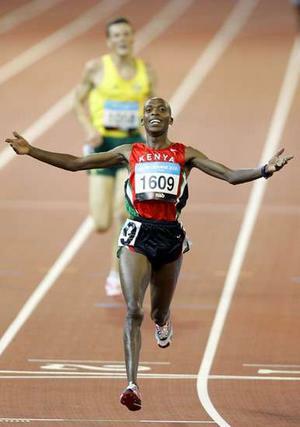 Paul Kipkoech the 10,000m runner. 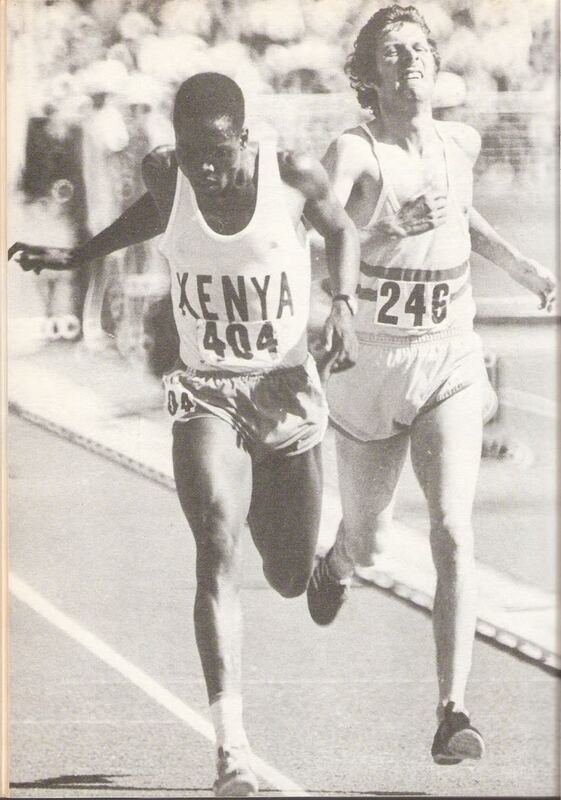 John Ngugi who won the world cross country championships in 1986. 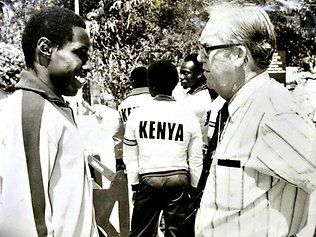 Billy Konchellah who had come within millesconds of winning a medal at the 1984 Olympics and possibly Ruth Waithera who incredibly reached the finals of the 400m at the 1984 Olympics. In boxing, Kenya was at the peak of its power and would most likely have retained the commonwealyth games title. Amongst the excellent boxers Kenya had were John Wanjau, Ibrahim Bilali, Steve Mwema, Crispin Odera, Sylvanus "Sulu" Okello and Patrick Mont Waweru. 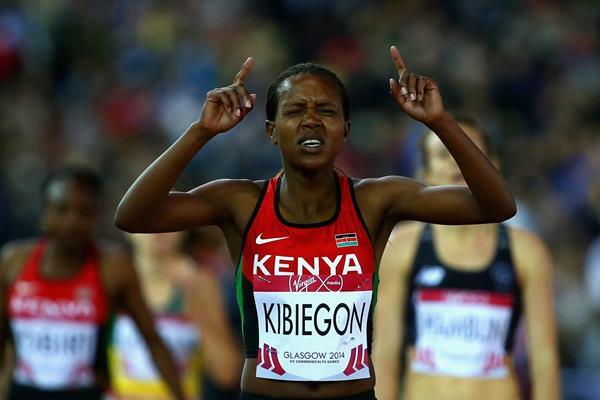 With 1 gold , 1 silver and 2 bronze, this is perhaps the worst performance by Kenya at any global event. 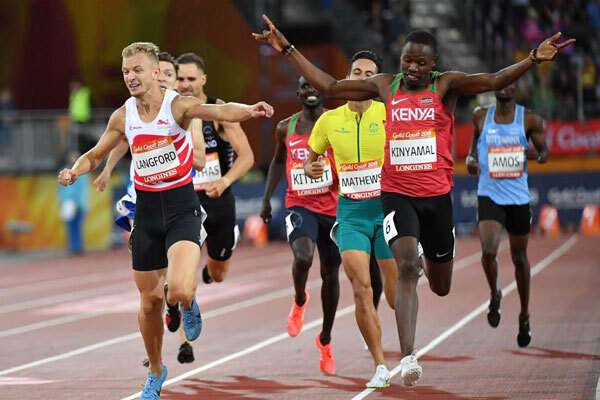 It was largely because the sport of athletics was in a depressed state after Kenya rightfully boycotted the 1976 Olympics and participated in the ill advised boycott of the 1980 Olympics. At the time the sport was fully amateaur and the maion motivation that athletes had was the Olympics. 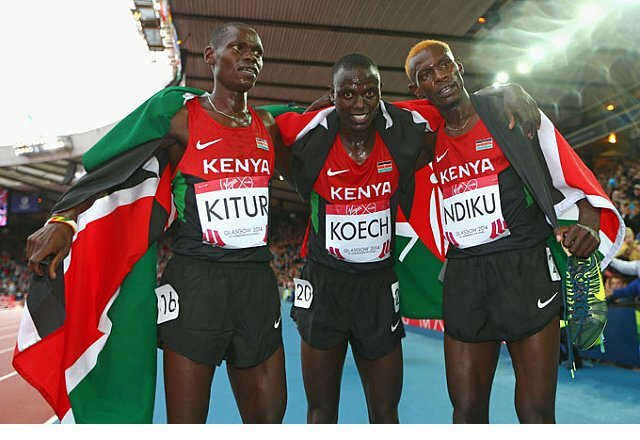 With nothing to motivate Kenyan athletes, their performance plumetted. With 3 gold medals in boxing, it is the only time when Kenyan boxers had done better than the athletes in a global event. Kenya became the commonwealth games boxing champions. 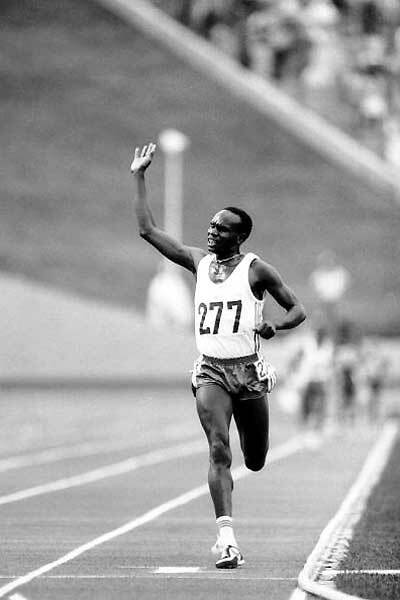 Henry Rono was undoubtedly the star of the 1978 Commonwealth games and perhaps the most talented runner Kenya has ever produced. Also notable was Tekla Chemabawai bronze medal in the 800m, the best pefromance yet for a Kenyan woman up to that point. Ben Jipcho was the star of the 1974 games with 2 gold and a bronze, showing the kind of strength that is rarely seen nowadays. The most notable event of the 1974 for Kenya was the bronze medal won by Sabina Chebichi who became the first Kenyan woman ever to win a medal in a global event. The 1974 Olympics are the only time Kenya has ever won medals in the short sprints with Fatwell Kimaiyo winning the 110m hurdles and John Mwebi winning silver in the 100m, finishing second to Donald Quarrie who was the Usain Bolt of that era. 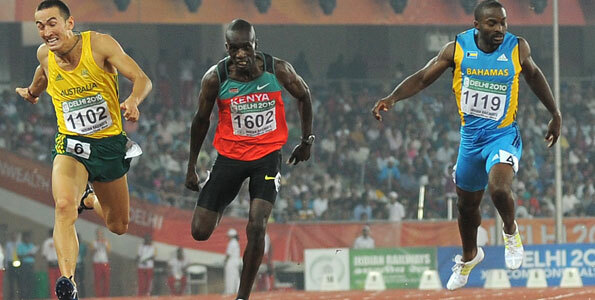 Charles Asati won the 400m and completed Kenya's superb spint peformance by leading the team to victory in the 4 X 400m relay. 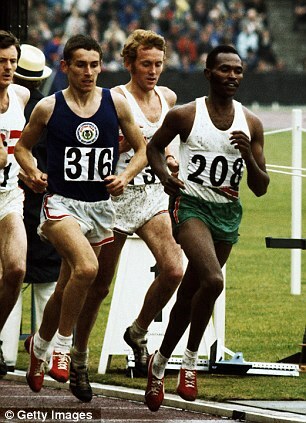 Kipchoge Keino with a gold medal and a bronze medal was Kenya's best performer in the 1970 games. Here he is seen in the 5000m final. 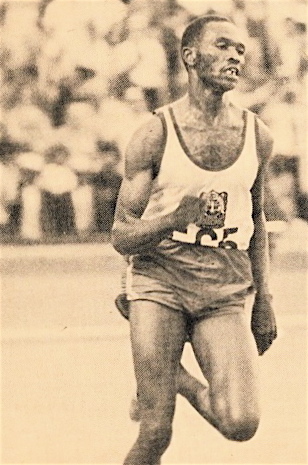 Whereas nowadays it is uncommon for athletes to double up, Keino ran in at least 2 or 3 events every time he competed. 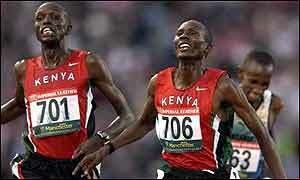 At the 1996 British Empire games, Kenya announced itself to the world as a power in distance running and boxing. Interestingly, all of Kenya's medals at the 1962 games came in the sprints. 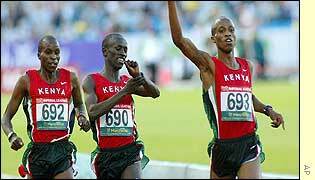 Kenya did not win any distance running events. Seraphino Antao's double gold medals were the highlights of the entire games. Not only did he win, he literally blew away the field. Kimaru Songok won the silver in the 440 yards hurdles. In boxing, Ali Juma and Philip Waruinge announced Kenya's arrival as a boxing power. 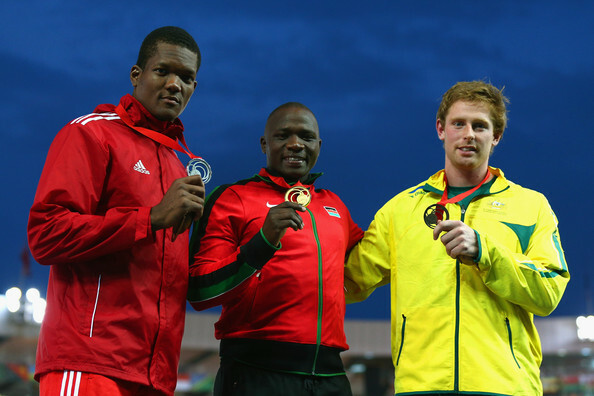 Kenya would remain a fixture in the top tier of commonwealth games boxing until 32 years later. 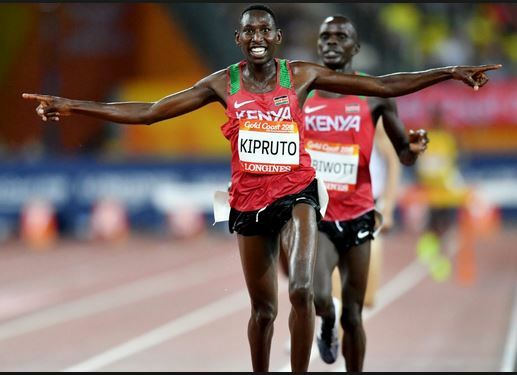 Arere Anentia and Bartonjo Rotich announced Kenya's running prowess when they won Kenya's first ever medals in a global event. Kenya did not win any medals in 1954. 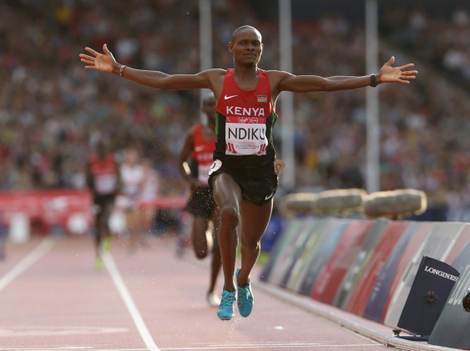 Nyandika Maiyoro came closest to winning a medal when he finished 4th in the 3 mile race.